The coach is a festive horse carriage used by monarchs for traveling and ceremonial trips, an essential attribute of royal power. 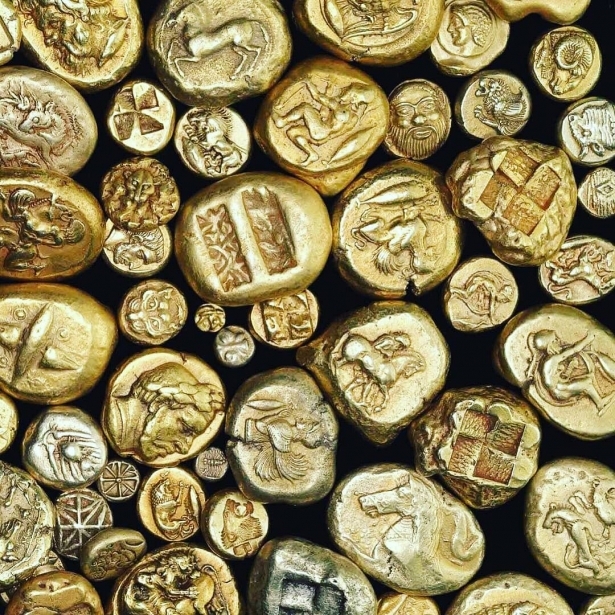 The richer and more skillful the coach is, the greater the ruler looks. Exquisite handmade carriages are masterpieces of decorative art. In the first article we tell about the luxury coach used by the Dutch royal family. The Netherlands has a beautiful tradition: every year the monarch takes a ride from the Binnenhof palace complex to the Knight's Hall, where the monarch makes an appeal to the country’s Parliament. 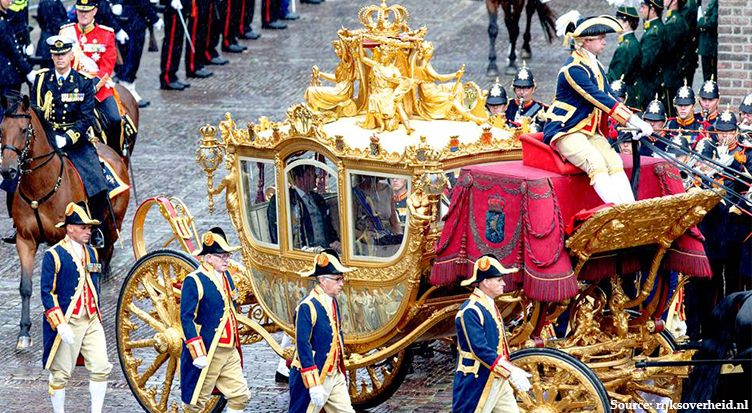 The monarch takes a ride in the magnificent "Golden Coach" (Dutch: Gouden Koets) owned by the royal court. It was designed and built by the Spijker brothers, the legendary hand-made car manufacturers. The exquisite coach was a gift from Amsterdam citizens to Queen Wilhelmina in honor of her official accession to the throne in 1898. The golden coach is made in Dutch Renaissance style and is distinguished by its luxurious exterior. At first glance, it seems that it is entirely made of gold, but in fact the coach is made of teak wood from the island of Java and is generously decorated with gold leaf. 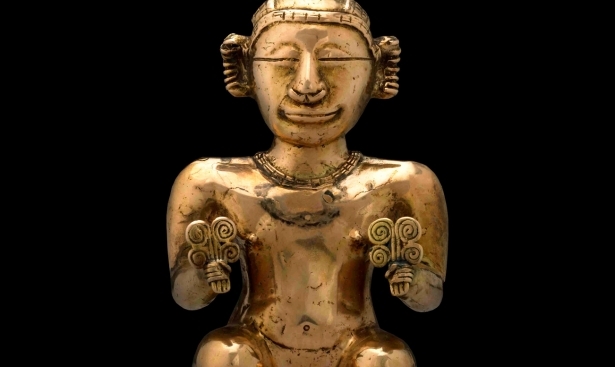 The cart is decorated with numerous sculptures and drawings. It is also equipped with a special bent form of the coach’s roof so that the head of state can welcome residents standing upright. 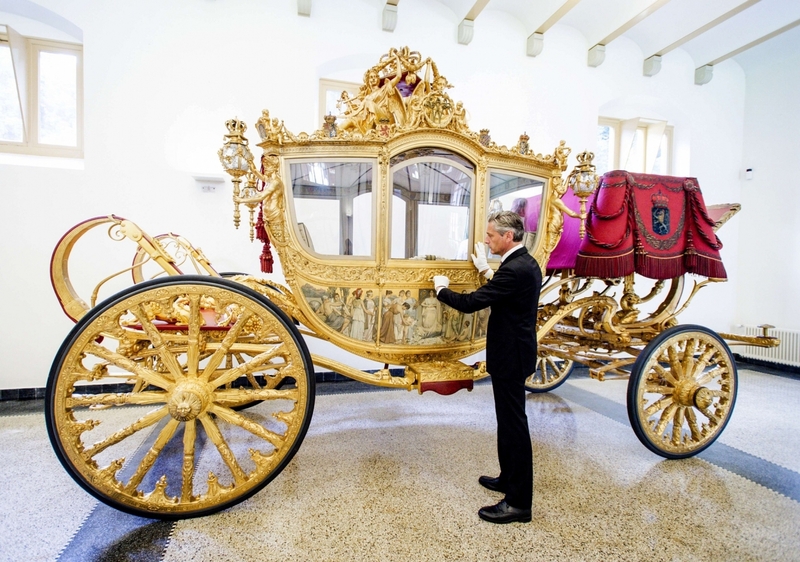 According to the royal protocol, only the head of the country or heirs to the throne can use the golden coach. When the monarch walks, the carriage is harnessed with eight horses. Six horses are required for trips, arranged for the heirs to the throne. In the photo: four footmen walk along the carriage, if needed, they open and close the door, lay out the folded steps and assist royal ladies, helping them to get in and out of the coach. Thematic images on the sides of the coach reflect four sectors of the economy: agriculture, trade, manufacturing and shipping sectors. 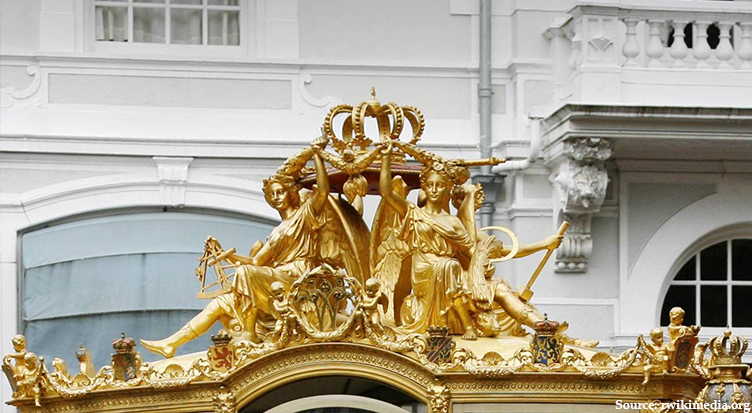 In the photo: there is a golden sculptural composition with a large crown placed on the roof of the coach, symbolizing the royal power. Small sculptures of dogs and owls adorn door handles, representing symbols of loyalty and vigilance. Gold lilies are drawn on the steps: a symbol of caution. 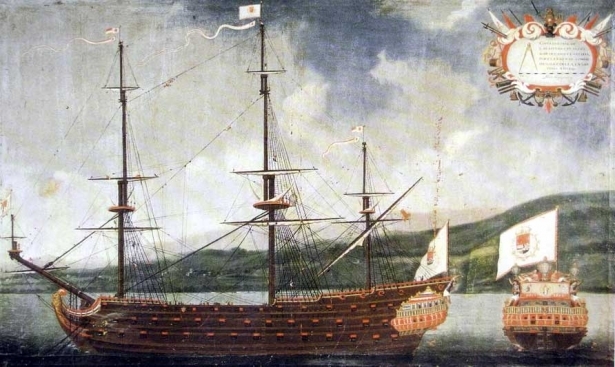 The cabin of the coach is supported by four golden Atlantes, carrying lanterns in their hands. The interior of golden carriage is covered with expensive fabric, which is hand-embroidered with silk threads. The popular Dutch flowers are depicted on the carpet: tulips, hyacinths and daffodils. 1200 people worked on the coach’s design.